Who would be the spoiler? It all came down the 4 x 400 for the boy's Class A State Track and Field Championship. The 4 x 400 generates an electric atmosphere in even a run of the mill four-team mid-season meet. The day is nearly done, the numbers nearly figured, the temperature is easing off and there is one last opportunity to work as a team. In a championship with all the marbles on the table and three teams still having a realistic crack at the top spot the atmosphere around the starting area crackled with anticipation. Thornton Academy, anointed the favorite by the Portland Press Herald, led with 65 points, Falmouth and Cheverus followed with 59 and 58 points. Complicating the calculus of what to look for was the fact that Cheverus's relay team, with a seed time of 3:42 would compete in the second heat, rather than the faster last heat. In the last heat the Trojans and Yachtsmen would at least be able to see another. But Cheverus would run against the clock. So who would be the spoiler? Six other fast teams toed the line in the last race too. 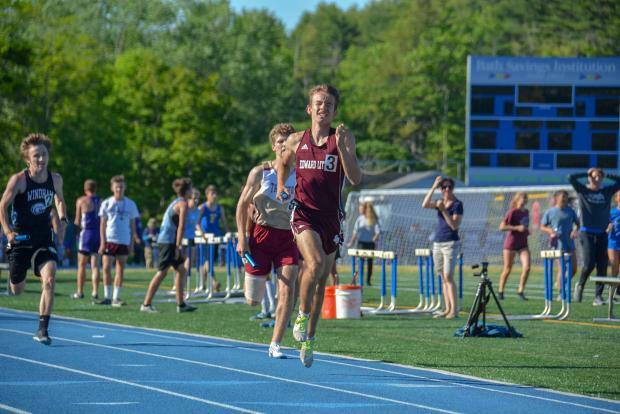 It ended at the finish line as Bonny Eagle's Zachary Allocca's lean was enough to get the top spot for the Scots besting Falmouth by just 0.09 seconds. With the eight points for the second place finish the Yachtsmen ended with 67 points and the lead. Cheverus, winning the second heat, slid into third overall, the six points the Stags garnered left them with 64, just short of the mark. 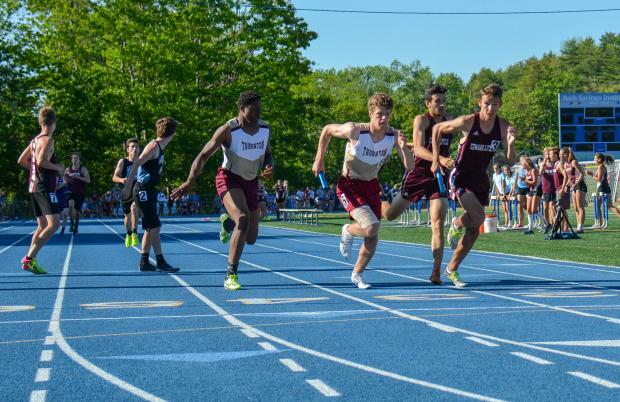 But Thornton Academy was still on the track. Seeded sixth the Trojans needed a fifth place finish but were running behind Lewiston and Edward Little. The Blue Devils team featured two runners, Jeremiah Williams, and Noor Shidad who had already been to the podium for the open 400 taking the sixth and third spots. And Lewiston's lead looked comfortable at the final exchange. The Red Eddies's team was anchored by senior Russ Allen, the Indoor State title holder in the 800 who, this day, had already gritted out a seventh place medal in the 400. At the final exchange Thornton had a shot at EL with maybe a step on EL's Allen. In the end Allen got a lead he was able to hold on to. The Trojans ended sixth, picking up two points and leaving them tied with Falmouth at 67 points a piece. The Maine Principals Association, always on their toes, tossed a coin to see who would take the trophy home, and promised another would be delivered to the co-champion as soon as possible. Cheverus finished third with 64 points, Scarborough and EL rounded oiut the top five at 60 and 56.5. Thornton Academy got 52 of its 67 pints from Travis Snyder and Jason Montano. Snyder was s three-time Champion as he took the 110 meter hurdles (14.96), the 300MH (41.53), and the pole vault (14-09). Snyder also collected a sixth place finish in the long jump. Montano won the discus with a throw of 145-07 and put the shot 55-02.75 for his second title on the day. Montano had company on the shot put podium as teammate Thomas Palmer collected the fifth place medal and the three points that went with it. Longhao Chen bested Snyder on jumps at the long jump to take the fifth spot there. Chen was also a part of the Trojan's fifth place 4 x 100 team. He was joined there by Dominic Dadiego, Dawson Desrosiers and Isaac Ofielu. Desrosiers and Ofielu also ran in the sixth place finishing 4 x 400 team with Owen Hey and Landon Heidrich. Collecting an important fourth place to go with its points in the race-walk was Lucas Judice. Falmouth had no individual champion. The Yachtsmen's only first place finish was the 4 x 100 team of Ethan Ali, Adrian Friedman, Alvaro Fuentes, and Kyle Bouchard who circled the track at 44.16 The team theme continued as the Yachtsmen took second on each of the other relays. Aidan Hoffman, Ben Greene, Charlie Henning and Sam Larlee opened the meet taking eight points with a joint effort of 8:28.79 in the 4 x 800 relay. Fuentes and Bouchard scored again at the end of the day in the crucial 4 x 400 where John Auer and Douglas Cooke joined them to complete the team 1600 in 3:30.69. Otherwise, both Auer, Cooke, Fuentes had big days. Auer, seeded first, took second to Mt. Ararat's Lisandro Berry-Gaviria in the 1600. Auer also notched a third place finish in the 800. Cooke was second in the open 400 at 52.13 and collected two more points with a sixth place high jump finish. In addition to his two relay performances Alvaro Fuentes claimed second place medal for the 200 at 22.76. 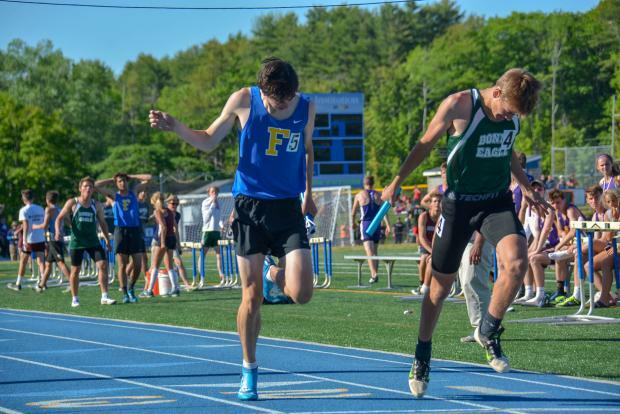 Kyle Bouchard also placed for Falmouth in the 200 as he claimed the last point there. Ben Greene added a sixth place finish in the 1600 to his leg of the 4 x 800. Wrapping the scoring for Falmouth were Connor Piers, who ended the 3200 in fourth place, and Josh Bradford who claimed sixth at the shot put circle. Like their counterparts on the women's team, the Cheverus men collected a lot of points in the shorter races. 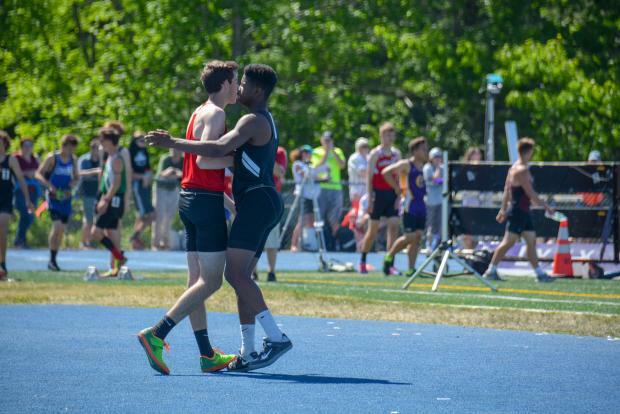 Where the girls team pushes itself over the top by dominating the horizontal jumps, the Stag's men's team supplemented its scoring in the throws. 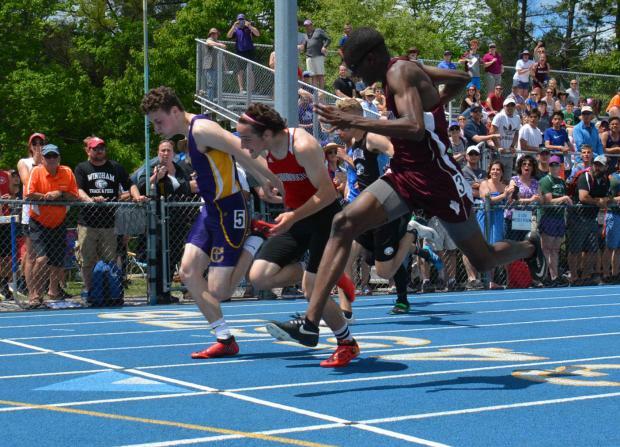 Sean Tompkins took firsts in the 100 (11.06) and 200 (22.64) and took legs for both the 4 x 100 and 4 x 400 teams. Owen Burke claimed the top spot in the 400 (51.25), was third in the 200, and also took legs of both of the shorter relays. Christian Gilliam was second on the javelin with a throw of 171-09. 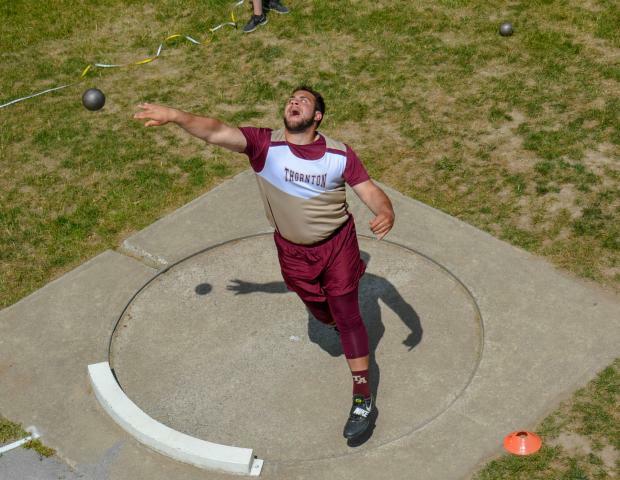 Meanwhile, first year Giovanni Fornaro was third at the discus and took fourth in the shot put. Fourth place Scarborough, with sophomore Jarett Flaker out nursing an injury, got strong performances from Anthony Clavette and Ben Hatch. Hatch, after notching the top time in the preliminaries, took second in the final at 11.07, he collected another eight points with a second in the long jump (21-08.50), and placed in the 200. Clavette took second in the high jump clearing 6-2, third in the 110 hurdles, and fifth in the triple jump. The Red Storm also got a third place finish in the pole vault from Drew Gardner. Scarborough had a great opening to the meet as their 4 x 800 team claimed the first championship of the day. Harrison Osborne, Erik Larkin, Tristram Coffin, and Noah Drapeau cover the 3200 meters in 8:23.27. A healthy Flaker had the potential to take the top spots in the 100, 200, 400, and 300 hurdles. Just a sophomore, Flaker will be back. Fifth place Edward Little got it's lone first place from Matt Syphers in the race-walk who cruised to a half minute victory in 7:44.41. The Eddies also had strong performances from senior Russ Allen with a second in the 800, seventh in the 400, and an anchor leg in the pivotal 4 x 400. Senior Connor Jackson scored in four events-the high jump, triple, 300, and 110 meter hurdles-while Fabrice Mpoyo took third in the 100, fourth in the 200, and scored in both the 4 x 400 and 4 x 100 relays. EL put three hurdlers on the podium for 110 MH. Windham's Alex Wilkins was a double winner as he took the titles in the triple jump (44-01.25) and the long jump. Both marks represent new personal bests for the senior, and each represents the best performance in Class A for anyone this season. Oxford Hills had a pair of great performances. Dawson Stevens, who won the javelin with a throw of 173-00, also snagged the last podium spot in the 100. 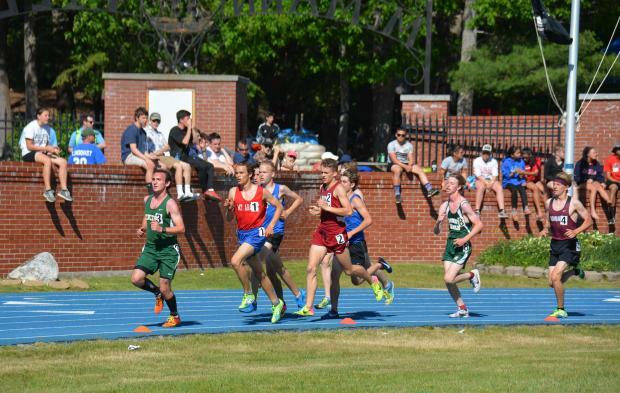 A second doubles scorer for the Vikings was Dominic Sclafani who finished third in the 3200 and fifth in the 1600. Scafani's pace and take-no-prsinoer's attitude in these two races always makes them more interesting and forces the rest of the field to compete at a different level. Both Sclafani and Stevens are seniors. One of the prime beneficiaries of Sclafani's pace setting was Mt. Ararat's sophomore Lisandro Berry Gaviria whose late kick put him on top of the podium for both the 1600 and 3200. His 4:26.66 was a new personal mark for the 1600. Bath's McCann Field is an excellent complex with plenty of seating for the track and decent viewing for most of the field events; they also have a renowned concessions stand, but it is not likely that a lot of low times will ever be set at McCann in the 3200. The turf field with its granular black substrate absorbs and radiates heat that seems to accumulate over hours. Weather data showed a high of 78 for Bath, but track-side temperatures were well into the 80s. Even the stiff breeze that added a perilous, quivering dimension to the high jump bar, and provided a stiff head wind down the back-stretch offered little relief. Officials decided to provide 3200 runners with some solace by spraying the runners with a hose at the third corner. Wyatt Lord, last year's runner-up in the 800, took the top spot this season at 2:02.02. The junior from Hampden had some company on the podium as fellow Bronco Jason Mathies took the final place. Rounding out the individual titles was Brunswick's Sam Cenescar who collected half of the Dragon's twenty points with a first place finish in the high jump. 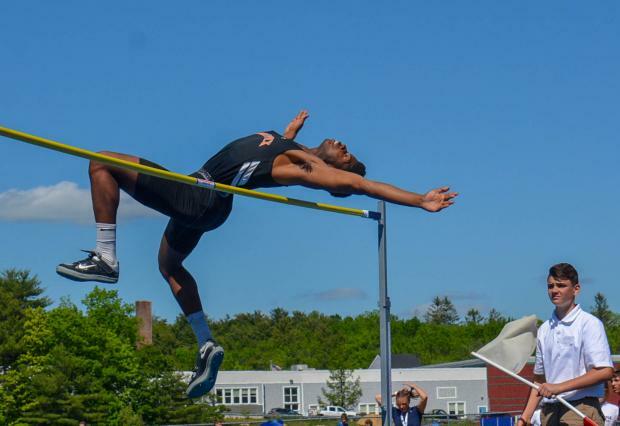 His jump of 6-05.25 set a new outdoor high mark for the sophomore. He has gone 6-06 in the indoor season. Cenescar was pushed by Scarborough's Anthony Clavette, the reigning indoor champion, just as he was last week at the KVAC meet by EL's Connor Jackson.